Collaboration and collective intelligence are much talked about in tackling issues both global and local, and were recently further endorsed by the launch of a new centre at MIT. We'll certainly need all the wisdom we can manage to rise to the challenge of climate change. Fair enough, but how do you muster your fellow thinkers and doers? We may be seamlessly connected by the Net, but experience suggests that collaboration online does not come naturally. I think I may have found an answer - or at least a testbed - in a 250-year-old institution tucked away in London's John Adam Street. It's the Royal Society for the encouragement of Arts, Manufactures and Commerce, set up on on a manifesto "to embolden enterprise, enlarge science, refine arts, improve our manufactures and extend our commerce". 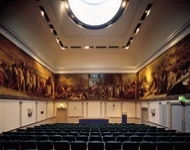 The Great Room - left - continues to host excellent lectures, but the more hidden talents of the RSA hold the greater promise, as I found the other day when I went along to an evening for new Fellows. There are 26,000 Fellows, and I felt privileged to become one for a modest annual sub of £122 (more later on the privilege). The building is splendid, with bar, library, restaurant, meeting rooms and such like, plus lots of events and projects around five manifesto challenges: Encouraging enterprise; Moving towards a Zero-Waste Society; Developing a Capable Population; Fostering Resilient Communities; and Advancing Global Citizenship. It certainly seemed the very model of an ancient and modern think tank, already applying itself to climate change with a challenge to Fellows and non-Fellows alike to reduce their carbon footprint to five tons. Chairman Gerry Acher confessed to 25 tons currently, and said he would be trying very hard indeed to cut back. However, there is room for improvement at the RSA. The 24,000 Fellows in the UK, and 2000 around the world, represent a lot of intelligence ... but at the moment they aren't very collective. A couple of years ago a group of women Fellows began a bottom-up move towards greater involvement, now called FellowsVoicesRSA, but it is a limited voluntary effort (though none the worse for that). Chatting the other evening to staff and Fellows I got the strong sense that change was due ... and possible. Matthew Taylor, former adviser to Tony Blair is taking over as chief executive. They are looking for a new head of communications. While the RSA's current web site is an admirable resource, complete with RSS feeds, it is a bit, well, institutional compared with Demos. And that's a general problem. The RSA wants to stay distinguished, but it also wants more Fellows who are younger, and more diverse in their background. Here's where the "privileged to be a Fellow" bit comes in. Although people do tend to put FRSA after their name, and begin questions at lectures with "as a Fellow...", it isn't all THAT distinguished. You have to get a Fellow to nominate you, but I gather no-one gets turned down. Well, maybe there was that chap who had been inside for fraud ... but I think you will be in if you are a decent sort, and can pay the sub. Note to self: must spend more time in the RSA bar library and Get Involved. Update: as I write a charming email arrives from RSA Fellowship and Marketing Director Stephen Farrant, inviting me to one of their "lunch and learn" sessions to extend the conversation we started about blogging, Web 2.0, social networking and the like. I think I mentioned setting a social reporter loose among the Fellows. My enthusiasm to accept is only tempered by dim memory that I was one of the last to leave the Fellows evening, and generous hospitality encouraged a certain joviality on my part. Still, the staff were exceedingly good humoured on that occasion, and I'm sure lunch with emphasis on the fizzy water will put me into the correct frame of mind next time. I'll certainly be using public transport, Gerry.